Last Saturday morning saw the initial running of the Beach Cup Golden Criterium on a tight 850 metre circuit on the Rockingham Beach foreshore and cafe strip. It was intended to run both a men’s and women’s elite race. However, with most of the best women riders in Perth participating in the Tour of Margaret River. 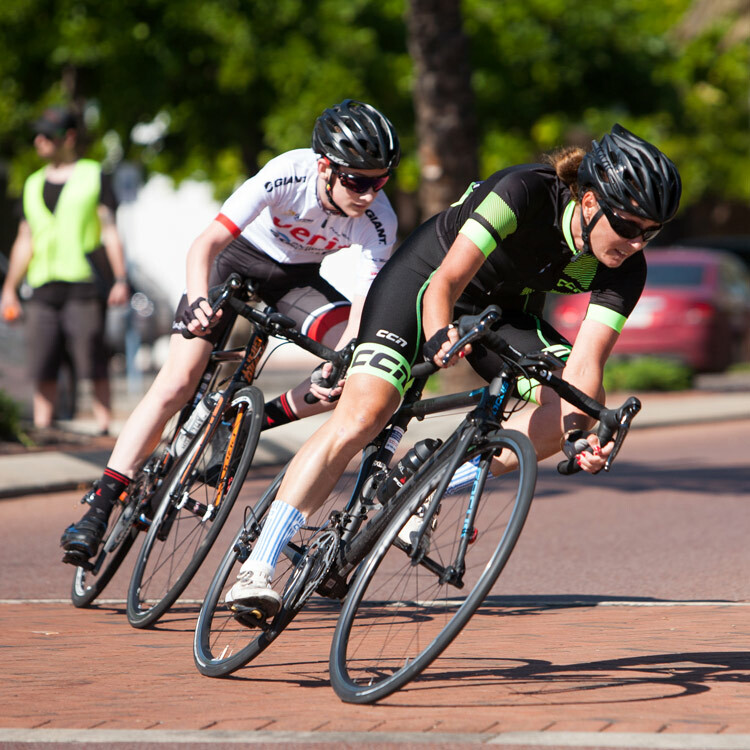 The women’s race was converted to a support race, open to under 17 boys and girls, as well as C grade men. The result was a entertaining race. Melissa Robinson attacked on the second lap and built a small gap. Matthew Connan bridged the gap and the pair attempted to build a margin. Behind the pair, the pursuing group lost riders, until there was only three left. Dharlia Haines, Laura Hodges and Calum Milne, they worked together and slowly closed the gap. So that by the halfway stage there was five riders at the front and behind them a chase group of four. The leaders slowly extended their margin by riding at a steady pace, the was a couple of tentative attacks which were quickly covered. Then with five laps to go Matthew Connan attacked and quickly got a gap, as everybody in the lead group looked at each other to chase. It took a lap for the chase to begin and that was ineffective. Connan was still increasing his lead. With two laps to go it looked like Connan was tiring, but the group then sat up on the next lap, more interested in their positions in their respective group rather than the outright win. Connan kept working hard and took the outright win and under 17 boys. Haines took out the sprint for second and top under 17 girl. Laura Hodges was third and first open women. Tom Power, lead the second group over the line for first C grade men. While the women’s field was depleted, only a few elite men were missing from the field. The rider pool was boosted by three riders returning from overseas. 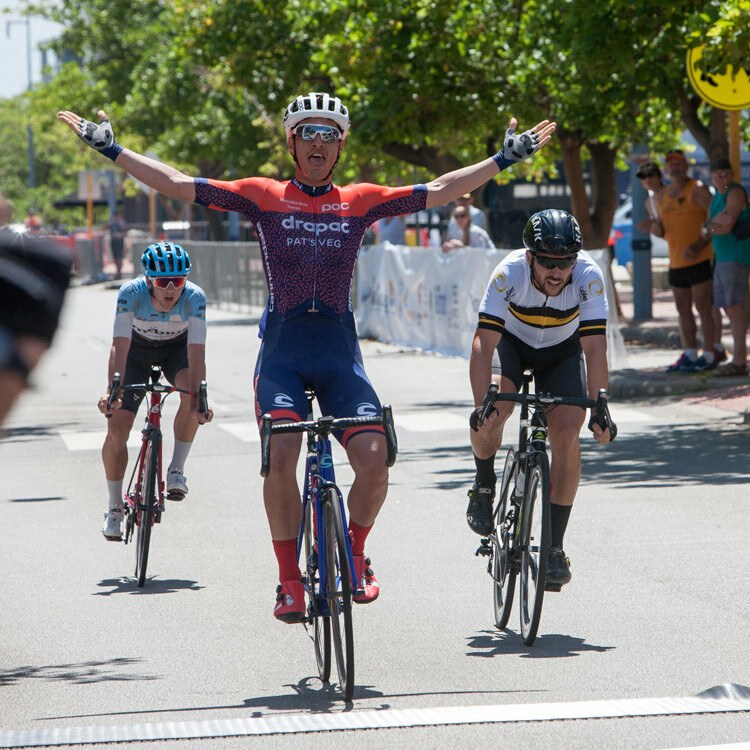 Stephen Hall after racing the criterium circuit in the US for six months, with considerable success, returned a couple of weeks back and won the State Road Race title. Theo Yates had just returned from the Tour of Iran, were after a number of top ten finished, won the final stage. Tyler Lindorff from representing Australia at the under 19 World Track Championships in Italy. The attacks started early and after a few laps it was Logan Calder and Henry Penell in a break, Jackson Mawby bridged across to them. This caused a reaction from the bunch and the breakaway was slowly drawn back in. A counter attack then saw Matt Upton off the front and quickly joined by Mawby. The pair started building up a small margin. Then suddenly one rider tried to bridge, then there was three, four and finally five as Lindorff joined the pursuers and the remains of the bunch started splintering. With five of the strongest riders in the race Hall, Yates, Lindorff, Calder and Byran Staring in the pursuing group, the breakaway and the bunch had no chance. The breakaway was caught, the riders then worked together to make sure no riders could chase back on. With five laps to go Upton attacked, he was quickly chased down, then Mawby counter attacked and got a gap as the other riders looked at each other. With three laps to go Mawby looked strong and was building a lead over a disorganised chase. Two laps to go Mawby was tiring, but he still had a handy gap over a slowly gaining chase. With a lap to go Mawby was faltering, Hall launched himself over the gap, closely pursued by Lindorff and Yates.In the three rider sprint to the line it was Yates first, Hall second, Lindorff third, Mawby faded to seventh. Well done PDCC Members Matthew Connan, Dharlia Haines, Theo Yates, Tyler Lindorff and many more who rode their hearts out. The feedback from the riders and spectators was very positive about the race, particularly the circuit and the atmosphere, so hopefully the race will be back next year.